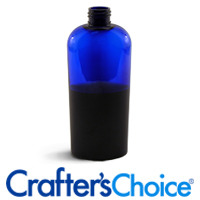 This small half-ounce glass bottle is cobalt blue in color with an 18 mm opening. Works with 18 mm tops (sold separately). 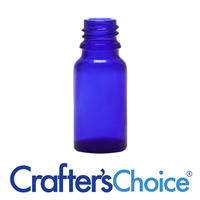 Use this 4 oz Blue Basic Jar, made of PET plastic, to package bath salts, body creams, and specialty cosmetics. these beautiful blue jars are sure to make your product stand out! Jar Height: 2.25". Top Requirement: 58/400. Bottle Height: 5.25". Top Requirement: 20/410. Best Shrink Wrap Size: 65x55. Holds 4 oz of product. Bottle Height: 6.75". Top Requirement: 24/410. Best Shrink Wrap Size: 80 x 55. 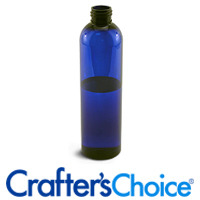 This Blue Cosmo Oval Bottle is made of PET plastic. This jar is made of polystyrene plastic. 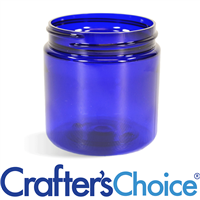 Jar Height: 0.625". A set includes one top and one jar. 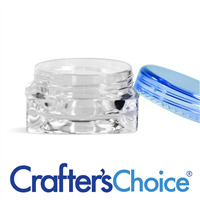 Holds 3 grams or 3 ml or 0.1 oz.